According to the common platitude, attitude is everything. While that looks good on a motivational poster or as a sound bite, it really is meaningless when it comes to innovation. True and consistent innovation will benefit from a little math. There are two inputs in this innovation equation: creativity and strategy. The degree to which each input is embraced or given priority will determine the outcome. Creativity is fun, adventurous and imaginative. It will lead to broad thinking and expanded possibilities. Strategy is focused, precise and calculated. It will deliver defensible results and peace of mind. Many companies rely too much on one or the other and not enough on both. Below are five equations to help maximize the overall impact of innovation. Innovation with an unpredictable result is the product of fully focusing the creative input and completely ignoring strategy. The creative juices are flowing and people are throwing away any boxed thinking. The conversation never gives way to strategic direction. In the end, the product is shiny but could simply be a flash in the pan. The immediate success, if any, will give way to less impressive results. 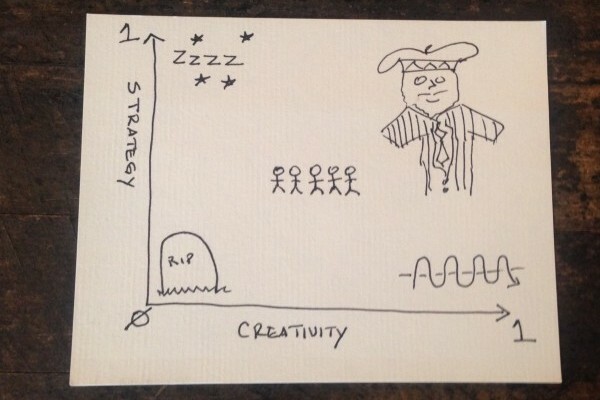 Creativity is inspiring, but strategy allows for predictable results. Consider the opposite situation — a team striving to develop a truly innovative solution by ignoring the role creativity plays and overemphasizing a strategic focus. These firms are too wedded to a careful and predictable outcome. This results in uninspiring innovation. Sure, the solution might work, but will anyone notice? Companies that rely on a strategy-only process are often under pressure to deliver a product and see the creative side as a waste of time. The goal is “good enough” instead of inspirational. There are companies that fail to provide creative or strategic inputs. These are the leaders who rest on their laurels. They are riding the wave of a previous success or are in the midst of change that causes an overall freeze to new innovation. Think of the inputs, strategy and creativity, as committed resources. Companies that fail to invest in either will soon disappear. The most frustrating equation involves underfunding or undercommitting to both inputs when full attention is required. These are the companies that believe in getting 100% of the result with 50% of the investment. Do more with less is often heard around the office. Implementing only a fraction of each input, when the plan outlines full resources in each area, results in innovation that is truly unchanged – only half of the creative tactics are used, or only half of the strategic plan is implements and full results are expected. This is where people often get fired. Don’t commit to true innovation if the resources are not provided. Full commitment to both creativity and strategy results in an innovation that is unmatched in the market. This is when one plus one equals three. Creativity and strategy are implemented in a way in which they build on each other. There is an additive nature to those two inputs that makes them stronger when used in combination. The shiny objects are tied to strategic goals and magic is made — and Pierre is all about magic. Some people have different feelings and attitudes toward creativity and strategy. People generally find one more comfortable than the other, but both are necessary. It is not simply one’s attitude that determines the outcome. The innovation equation requires a certain level of mathematical skills. If you don’t see it, it might be time for an aptitude adjustment. This was originally published as part of my monthly column in St. Louis Small Business Monthly. I am comfortable with failure. Obviously. Leadership Lesson: Determine true north, set a compass, follow it.